Aaron Tindall (B.M. '06) released his second solo CD in January 2014, titled "This is My House." The CD, containing all premieres, has received two Global Music Awards for "instrumental soloist" and "creativity/originality." The goals of the Global Music Awards (GMA) are to celebrate independent musicians, and to showcase original music, unique voices, and undiscovered and emerging artists. This prestigious international music competition brings attention to artists who are traditionally underrepresented by mass media, and are increasingly recognized by industry insiders. Aaron is an assistant professor of tuba and euphonium at Ithaca College. 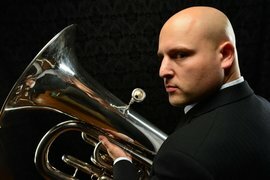 He holds a Doctor of Musical Arts degree in tuba performance and pedagogy from the University of Colorado-Boulder, and a master's degree in euphonium performance (with distinction) from the Royal Northern College of Music in Manchester, England, UK. His principal teachers included Velvet Brown, Mel Culbertson, Warren Deck, Mike Dunn, Steven Mead, and Daniel Perantoni. He has also studied with Roger Bobo, and Dr. Benjamin Pierce. He previously served on the faculty of Eastern Michigan University, and as a visiting tutor for tuba and euphonium at the Conservatoire National de Region in Perpignan, France. He is an active performer, with his solo playing described as being “remarkable for both its solid power and its delicacy” and his orchestral playing praised as "a rock-solid foundation." He has served as the acting principal tubist of the Iceland Symphony Orchestra, and has held the principal tuba position with the Aspen Festival Orchestra where he was an orchestral fellow. He frequently appears as a soloist and guest artist with orchestras, wind bands, brass bands, and at conservatories/universities throughout the United States and abroad. He has performed in England with the Grimethorpe Colliery Band, and has collaborated as substitute/additional tubist with the Colorado Symphony Orchestra, New Jersey Symphony Orchestra, and the New World Symphony. His solo playing has been heard on NPR's "Performance Today" radio show. Released to great critical acclaim, his solo tuba CD, Songs of Ascent, was nominated for a Grammy Award. He can also be heard on Velvet Brown's solo disc, Simply Velvet, and the Eufonix quartet albums End Game, Brink, and Furious. Aaron is a Buffet Group Tuba/Euphonium Artist and Clinician. He exclusively performs on the MW 6450/2 CC tuba, MW 2182/W F Tuba, and the Besson 2052-2 Prestige Euphonium.